Why would an American learn Norwegian? Democratic candidate Pete Buttigieg speaks Norwegian, and several other candidates in the 2020 race also speak a second language. But for presidential contenders, being bilingual is not always a plus. Why are Americans surprised when politicians speak a foreign language? Writer Asne Seierstad was introduced to Pete Buttigieg, a presidential candidate and the mayor of South Bend, Indiana, at a music festival in Texas last week. Without missing a beat, he began to speak with her about literature – in Norwegian. Mr Buttigieg has “a South Bend accent”, she says, but otherwise his Norwegian was excellent. Still she felt confused and wondered: “Why would an American learn Norwegian?” As it turned out, he’d decided that he wanted to read the work of Norwegian novelist Erlend Loe in the original language. When the story of Mr Buttigieg’s language ability appeared on Twitter, people across the political spectrum were impressed. Mr Nichols – and Trump supporters too – agreed that a Norwegian-speaking presidential candidate was an anomaly on the campaign trail. “The fact that he learned Norwegian so he could read Norwegian makes me want to know more about him,” says Michael Caputo, a former adviser to Trump. Mr Buttigieg’s mother, Anne Montgomery, is a linguist, and he grew up with languages. Aside from Norwegian, he speaks French, Spanish, Italian, Maltese, Arabic and Dari, says his campaign adviser Lis Smith. The fascination that Republicans and Democrats alike have shown in Mr Buttigieg’s skill as a language learner is part of a larger cultural story. In many ways the US is an insular society, and people there are less likely to study foreign languages than those who live in other parts of the world. In Europe more than 90% of students learn a foreign language in school, according to the Pew Research Center, compared to only one-fifth of students who learn a language in the US. The fact that relatively few people in the US can speak a second language means people there are amazed when their political leaders can. During this campaign season, other Democratic candidates have embraced the Spanish language and used their ability to speak the language to appeal to a broader swathe of voters. Democratic candidate Beto O’Rourke of Texas has launched Spanish campaign adverts. Senator Cory Booker of New Jersey has done the same. George W Bush also speaks passable Spanish (his brother Jeb is even better), but he is an outlier among presidents. Few in the modern era have spoken a second language – Trump and Barack Obama, for example, are fluent only in English. Politicians and leaders in other countries have done better. Kevin Rudd, a former prime minister of Australia, knows Mandarin. British Foreign Secretary Jeremy Hunt can give a speech in Japanese, and Nick Clegg, a former deputy prime minister, is fluent in Dutch (and speaks excellent Spanish). Winston Churchill spoke French – but with an almost comically English accent. President Vladimir Putin speaks excellent German. He apparently speaks English, too, but is less confident in his skills and tries to avoid speaking it publicly. In the US, linguistic ability does not always work in a candidate’s favour. For presidential candidates, everything is political, including the languages they speak, and on the campaign trail their use of language is seen through a partisan lens. In the past, a candidate’s facility for language has at times been cast in a negative light. Some Republican candidates have been under attack for being bilingual. During the last primary season, Mr Trump criticised one of his Republican rivals, Jeb Bush, for speaking Spanish. “He should really set the example by speaking English while in the United States,” Mr Trump told a Breitbart journalist in 2015. Chastising Mr Bush for speaking Spanish fit into Mr Trump’s own campaign narrative – he called for an overhaul in immigration laws and said that a wall should be built on the southern border. Democratic candidates have been sensitive to this manner of criticism, however. At times they have been so concerned about how voters might react to their linguistic skills that they tried to downplay them. John Kerry is fluent in French, yet he decided to hide his ability to speak the language when he was a Democratic presidential candidate in 2004. As a candidate, Mr Kerry was portrayed as an elitist who was out of touch with ordinary people, and he seemed to believe that his ability to speak French would be used against him. He may have been right. For some people in the US, the French language is seen as “a kind of shorthand for intellectual pretentiousness”, according to Mr Nichols, the writer. During the 2012 Republican primary, accusations were levelled against another French speaker, Mitt Romney. One of Mr Romney’s rivals for the Republican nomination made a video that cast him as too moderate for the party and compared him unfavourably to Mr Kerry. “And just like John Kerry,” says a narrator, “he speaks French”. Mr Buttigieg had no compunction about speaking Norwegian while he was campaigning in Texas, however, and he did not try to hide his linguistic talent. 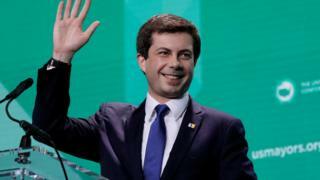 Still, political analysts agree that while the ability of Mr Buttigieg or another candidate to speak a foreign language will surprise voters – delighting some, and perhaps making others suspicious – it is unlikely to turn an election. Bruce Berke, a Republican strategist who is “50% Norwegian”, says that he admires Mr Buttigieg’s fluency in the language but doesn’t think it will win votes.